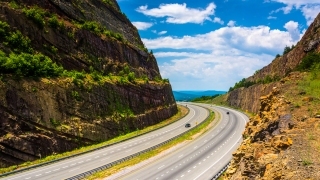 FILE PHOTO: View of I-68 from a pedestrian bridge at Sideling Hill, Maryland. Maryland is reopening a tourist welcome center in the western area of the state after a six-year shutdown. Friday's reopening of the Sideling Hill Welcome Center near Hancock follows a lobbying effort by some of the region's Republican state lawmakers, who say they made it a priority to speak with Republican Gov. Larry Hogan and his administration about it. Although the restrooms remained open on a seasonal basis, the visitor's center was closed in 2009 by the administration of Democrat Martin O'Malley to cut costs. State Sen. George Edwards and Delegate Mike McKay of Allegany County say they pushed for the reopening. Lt. Gov. Boyd Rutherford is among the officials scheduled to attend the event.